In 2008 I acquired a wife. The deal also included joint ownership of a cat and a rustic cottage on the Black Isle, a rural peninsula just north of Inverness. Life was good. 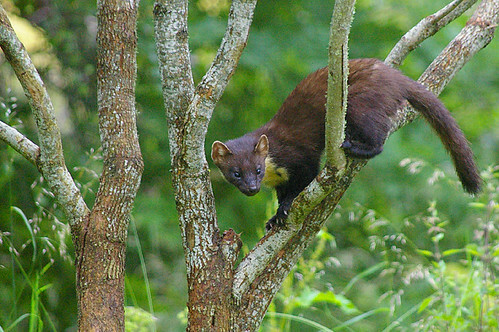 In 2009, a few days after we began our honeymoon in Namibia, an email from my cat-sitting sister informed me that she'd spotted a pine marten exploring our apple tree, and attached to prove it were some grainy snaps. We'd seen elephants, giraffes, big cats and other exotic animals in the wild (some of which would later help me gain my LRPS) and superb bush and desert scenery, but I was jealous. 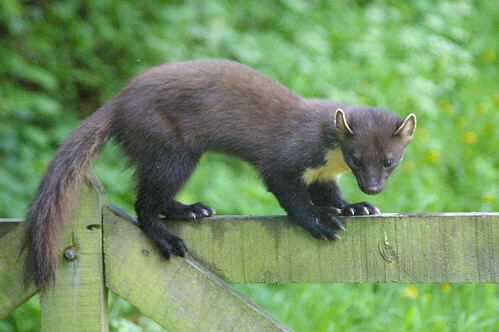 One of the UK's rarest animals had sauntered through our garden and I'd missed it. That afternoon I pulled the five-bar gate (I told you it was rural) into a position where it could be seen from the living room window, smeared the top bar liberally with Nutella, and kept watch. I expected nothing, but as dusk fell a stealthy form climbed up the gate and began to feast. My Pentax was soon in action, but even with the ISO pushed to its 3200 maximum all I gathered were a few brown blurs. Next evening I was more methodical. The tripod was placed in the window and the Pentax focussed on the gate. Would I be lucky two nights running? Yes! The images were grainy but I was delighted – I had halfway decent pictures of an animal that few people have seen, captured in my own garden. He was a male, one of this year's newborns, a local expert told me. During the next few months I continued to keep watch. As the days grew longer the ISO became smaller and I was able to lure him into our lilac tree to take portraits with no man-made presence in them. The resultant snaps would never appear on the cover of National Geographic but I was proud. At last, the day came when good light, an early visit and front cover poses coincided, so it was a pity that I was away photographing puffins in Shetland. 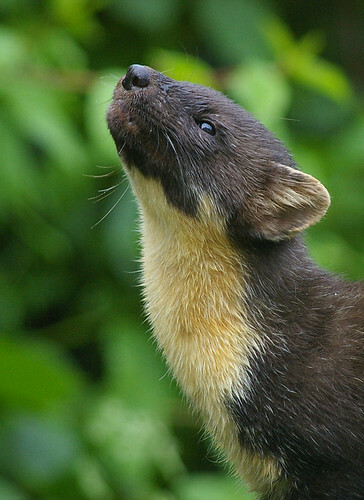 The beneficiary was the latest cat-sitter, who'd seen my martens on Flickr and become a friend. His photos were the best of the year. Despite that, we remained friends. Two weeks later, almost as if our visitor knew that August had begun, we stopped seeing him. The days were getting shorter. I continued to feed him Nutella, plus a more healthy side dish of nuts, raisins and a daily egg, plus the occasional mouse left behind by our cat; most nights the food disappeared. 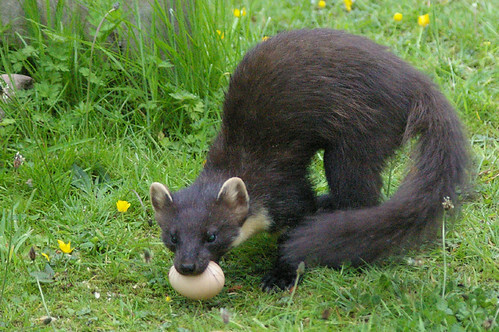 My reward came one April evening when the first sighting of 2010 was made. 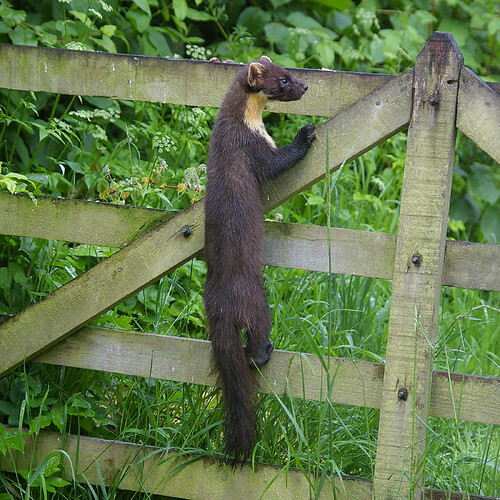 But it wasn't last year's visitor – this was another youngster. And after a few weeks of observation I realised we had two visitors (the shape of their bib identifies them) – one male and one female, neither of them last year's diner. There may have been a third but I'm not certain. Much snapping was carried out during the summer. Visitors were also seen early in the morning and, on one startling occasion, at three in the afternoon. My photos were still not National Geographic standard (shooting through window glass doesn't help) but they improved and one was a runner-up in a Scottish Natural Heritage competition. Now the days are short but I still sometimes see a shadowy figure tucking into free food and find paw prints in the snow. Maybe this year I'll take the award-winning photos that will become the centrepiece of an ARPS submission. One thing's for certain – the visitors have ruined me as a serious wildlife photographer. 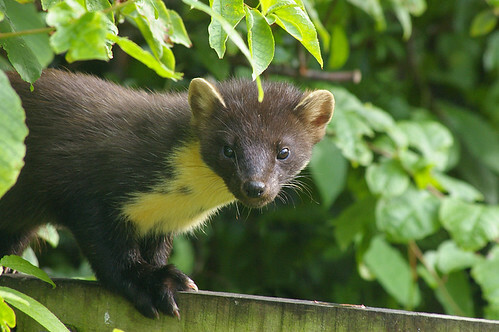 Snapping pine martens from the warmth and comfort of your own home makes it even more difficult to spend time in a cold, damp, draughty hide with no guarantee there'll be anything to see.